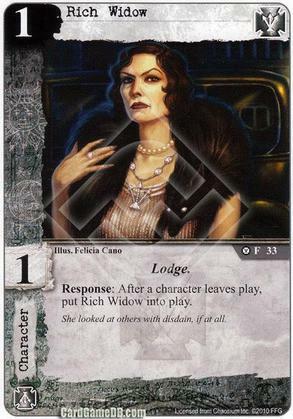 Flavor Text: She looked at others with disdain, if at all. Out-of-phase deployment, 1/1, and no icons: this dame looks tailor-made for sacrifice. Where can she trigger her Response from? Hand and / or discardpile? What do you guys think? How do you play this card? Hand. Cards only trigger from the discard if they state they do. Well, the same rule also holds true for triggering effects from your hand. Rich Widow's ability (as printed) doesn't specify that it can be triggered from your hand and therefore doesn't do anything at all. Kinda epitomic of FFG's struggles with rule templates and proofreading. Fortunately, they addressed the issue in the FAQ and added "from your hand" to the card's text. Now it works as intended. That is what I said, no? Your statement implied that Rich Widow's effect (without erratum) can be triggered from its controller's hand, which is not the case. I don't think it did. The OP asked where it could trigger from, I said Hand. Where did I imply this was without the erratum? You always use the erratum when defining what a card does. Well, it's obvious what you were trying to say if the reader knows the FAQ entry. Anyway, no need to argue about such trivialities. This makes it very clear. Thanks guys. Can she be triggered from returning to your hand due to HOST's effect for example? Yes. That makes her ideal for actions that demand a character return to hand to pay for a desired effect.